Biopics are trending in Bollywood these days. There are so many upcoming films on real-life personalities. This trend is receiving a great response from the audiences. People are nowadays more fond of knowing real life stories in a reel format. As many are already in queue, Indrajit Lankesh is one such filmmaker who has hopped on the bandwagon and is all set to present a biopic on Shakeela Khan, south film industry’s biggest adult star. Shakeela had the knack of pulling crowds to cinema halls week after week. Even big south superstars were puzzled about whether they should release their films in competition with a Shakeela film. After a massive hunt for Shakeela’s role, Indrajit came to an apt conclusion of having Richa Chadha on board for the role. Before commencing the shooting, Richa met Shakeela in Bangalore, to understand her life in a better manner. 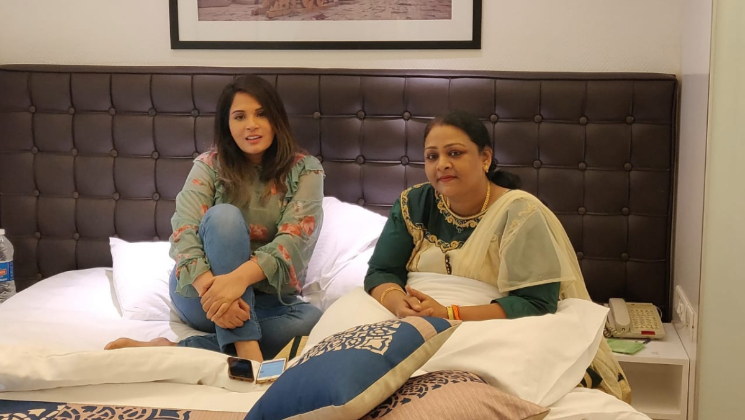 Seeing the camaraderie between both the actors and also to honour Shakeela’s popularity, Indrajeet roped in the real Shakeela for a cameo in the film. This would be a visual treat for all Shakeela and Richa fans to see reel and real life Shakeela in one frame! Sounds interesting, doesn’t it?